High-profile businesses benefit from a cleaner indoor environment by introducing a green wall, and show at a glance where their green ideologies lie. Britomarts Westpac Tatukai Square offices fly the green flag, for example. As cities expand equating to a loss of green space there's a steadily growing appreciation for implementing green systems outside and inside buildings with green roofs and walls. The idea is not new one of the first advocates of vertical gardens was American landscape architect and professor Stanley Hart White when he patented an idea calling for the first known vertical garden back in 1938. But the steady gain in popularity has been driven by a number of factors. For example, more efficient construction methods have made it cheaper and quicker to install green walls. There has also been a growing understanding and appreciation of their benefits physically, emotionally and financially. Let's take the last point first as money talks. Property developer Mirvac installed one of the first significant green roofs in New Zealand back in 1995 on its Quay West inner city Auckland development. This beautiful green roof was visible from floors above and cost around $100,000. The roof allowed Mirvac resource consent to build another four floors on the development equating to an extra $4 million in revenue at the time. Interior green walls also provide financial rewards in two other ways improving employees' work environments, leading to less absenteeism, and greater employee alertness and energy levels. 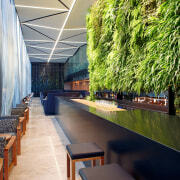 Studies on interior green walls have been shown to increase productivity by 20% as people are happy to be around them. 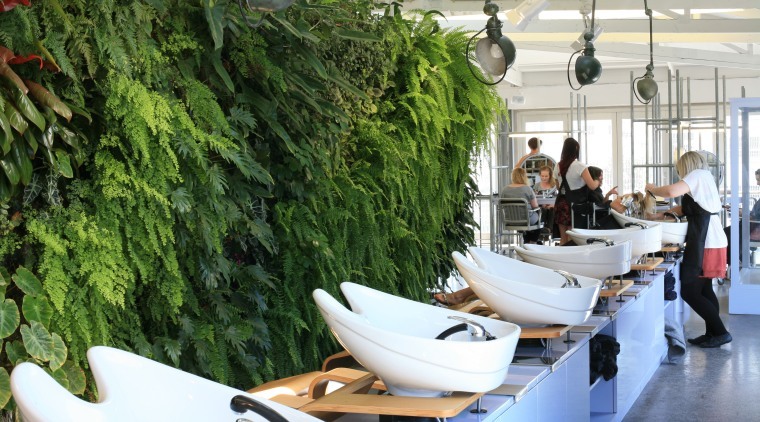 A green wall such as this one in the Stephen Marr Hair Salon, Takapuna helps improve interior air quality. 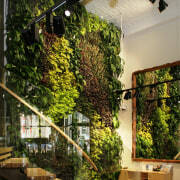 Green walls can also be great marketing tools according to retailers who install them. The Village Goldsmith commissioned a large 5m x 3m green wall in its new downtown Wellington store and it's better than a neon sign according to owner Ian Douglas. He says that, without exception, people comment on how much they love it. Douglas also adds that it's one of their favourite aspects of their new fit-out, saying that in terms of advertising, it's better than a flashing neon sign! The psychological benefits of including plants in the indoor environment have been known for a long time think of the Victorians and their leafy conservatories. However, little scientific research on their environmental and health benefits had been done until the 1980s, when NASA conducted a series of studies. NASA's principal investigator researching air quality on space stations, Dr William Wolverton, found that on top of absorbing carbon dioxide and releasing oxygen, as all plants do, many houseplants can help to naturally remove toxic substances from the air such as formaldehyde, benzene and trichloroethylene, which are common in modern buildings. This is an important benefit as, according to recent studies, indoor environments may be as much as 10 times more polluted than outdoor environments. 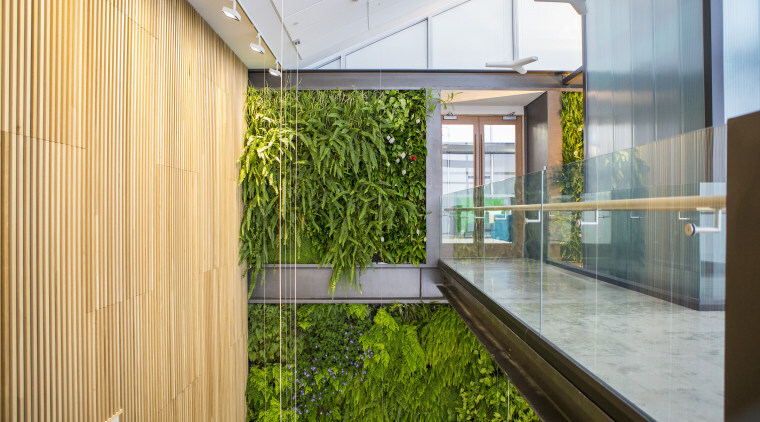 Because a minimum density of plants per cubic metre of air is required to effectively filtrate the air, green walls provide an excellent solution to this problem. Green walls contain 25 to 40 individual plants per m², thus providing the capacity to filter a large indoor area without taking up valuable space with planter boxes, and pot plants. Two well-known air cleaning work-horses are Peace Lilies (Spathyphyllum spp.) and Flamingo lilies (Anthurium spp.) as well as Rabbit's foot fern, (Davallia fejeensi) and Button fern (Pellaea rotuntifolia) to give an area a natural fresh forest smell. As well as being a natural air-filtration system, interior and exterior living green walls function to cool the air in the warmer summer months by a process known as evapotranspiration. 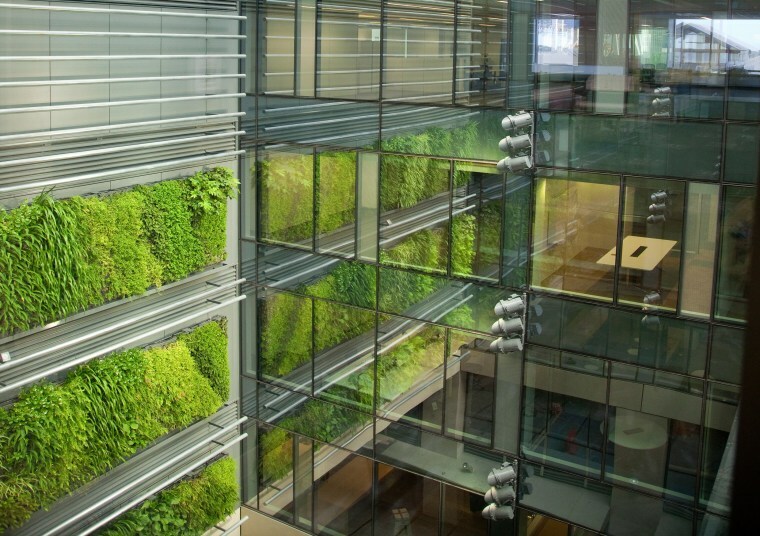 In fact, exterior living green walls can reduce wall surface temperatures by as much as 10ºC, resulting in significant energy savings and air conditioning costs, but also helping in cooling buildings and cities down. 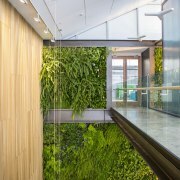 The top floor atrium of the Kathleen Kilgor Centre, part of the Tauranga Hospital campus, is green at heart another example of green walls in public environments. The winter months see the added advantage of insulation, thus reducing energy costs for heating the building. 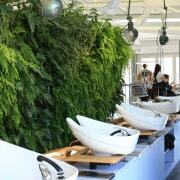 Reducing noise levels in buildings is one of the lesser known benefits of living green walls. Living green walls naturally absorb high frequency sounds while the supporting structure can help to diminish low frequency noise. 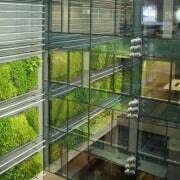 Green walls are also finding favour in civic environments with city councils wanting to green their cities. They also help to mitigate the loss of biodiversity due to the effects of urbanisation by sustaining a variety of plants, pollinators and invertebrates, and providing habitats and nesting places for various bird species. Green walls and roofs do one other important thing they are an easily identifiable symbol of the green building movement. 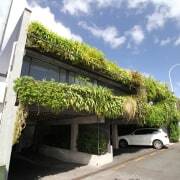 Green walls and roofs are highly visible and enable building and company owners to say we care about our people and we care about the environment'. That's a powerful statement to make.